Recently, I came across what started as a straightforward problem: In MySQL I was JOINing from Table A to Table B on a’s primary key, and wanted to display a list of all items in Table A, each followed by a list of all associated items in Table B. My initial thought was to hand-roll my own JSON, so that the result of the query would have a few columns with the results of Table A, then a column with the JSON-encoded data from Table B. I realize that one should never hand-roll their own JSON, but there isn’t a native JSON encoder in MySQL, so I had to make do. It was easy enough to come up with a basic JSON format using the following. I’ve done some pretty aggressive tabbing and newlines here to try to make the layers of functions as straightforward as possible; different arguments to each function align vertically. However, if b.name has a quotation mark (or a variety of other characters), this creates invalid JSON. How do we ensure that we always create valid JSON, even when there are special characters or unicode/multi-byte characters? Ensuring we always have valid JSON was surprisingly easy – we can hexadecimal-encode b.name in the MySQL query, which ensures that its character set is 0-9 or A-F, so it will always be properly contained within the quotation marks around it. We then convert it back into a normal string in the application code. So let’s say b.name was something like '☃' (because I know people are always naming their things [unicode Snowman]), the resulting hexadecimal representation is 27E2988327. Opaque, but definitely JSON-safe! Note that we also use COALESCE in case there are no associated items in Table B; otherwise CONCAT('[', NULL, ']' gives us NULL, not . Happy coding, and remember to be safe and always properly escape your strings! Feel free to ask questions or give feedback via Twitter. I was recently introduced to the game Ruzzle, a word finding game with some Scrabble-like scoring components. If you’re not familiar with it, check out their website and watch the quick introductory video. I was fascinated by how the game calculated all the possible words on each board. So I decided to program it. Check out the Ruzzle demo page, which creates a randomized board and finds all possible words. 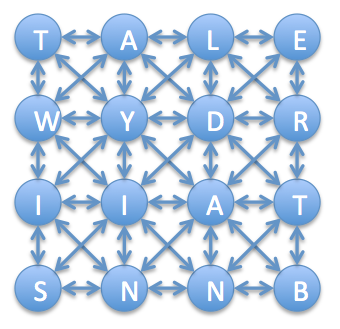 The way to do this search for all possible words is by viewing the letters as a directed graph where the letters are nodes and edges are connections between adjacent letters. Ruzzle graph. This was more of a pain to make than you might expect. With this graph, we can do a Depth-first search (DFS) for words starting at each node. First, we need to create a 4×4 board of letters. In order to create reasonable boards for English, we weight the letter distribution to that of their distribution in English. The following code creates the graph/board, assigns letters to each node/tile, and outputs the board. The basic graph objects are shown at the end of this post. First, we need to load and parse the dictionary. I’ve found this dictionary works well. Note the variable $dictionaryFirstNLetters. We use this to optimize our DFS by allowing us to “bail out” early in our search if we see that there are no words that start with our $currentResult. If you try taking out this code, you’ll see that this algorithm can take an incredibly long time to run – even with a $maxDepth of 6 characters (only find words with up to 6 characters), the runtime can easily reach a minute. It increases quickly as $maxDepth is increased. Below is our optimized depth-first search. The graph code I use is straightforward, and given below. * A node/vertex in a graph. * A directed edge in a directed graph. Update 2013/06/27: I’ve updated some of the code to match new SES interfaces. Unfortunately, this will silently fail on Amazon Web Services. But you do need to send those emails, right? Well, it’s pretty easy to get emails sent from AWS with Amazon Simple Email Service (Amazon SES). However, in my research on this, I found several false leads and no good tutorials, so here goes: step by step, how to send emails with AWS. Now that you have the the AWS SDK on your server, include AWSSDKforPHP/sdk.class.php into your application. You now have access to the AmazonSES class. The following is a basic function to emulate PHP’s mail(). Note that you need to define the AWS_KEY and AWS_SECRET_KEY for your application. You can find these by going to your AWS Security Credentials page and looking under “Access Keys”. Next, define AWS_SES_FROM_EMAIL to be the email address from which you want to send emails, e.g. no-reply@example.com. If you try to send an email at this point, you’ll get a MessageRejected error with the message “Email address is not verified.” Several pages I visited recommended I download the Amazon SES Scripts (Perl), but don’t do it! You’ll need to subject yourself to a world of pain in the form of installing Perl modules* (and probably Perl too, given that you’re reading a post on PHP!). Instead, you can actually use AmazonSES to verify email addresses in PHP. Much easier than the Perl script shenanigans. This will send an email to your sending email address with a link to verify that you own that email address. Do the same for your recipient addresses (since you’re in sandbox mode, which has restrictions including the requirement to validate your recipient address). Verify each address and you should be good to go to send emails. At this point you’ll be able to send a couple test emails, but the volume is fairly limited. Request production access and you should be granted the ability to send many more emails and not need to verify recipient email addresses. Visit the AWS SDK for PHP reference page for much more information on how AWS SDK for PHP works. If you do want to install the Amazon SES Perl scripts and are getting an error along the lines of “Can’t locate XML/LibXML.pm in @INC…”, you can use yum to install all of the necessary packages to get them to run. Thanks to this post for that hint. Let’s write up our basic Observable object. You may want to make this class abstract since it’s probably not useful on its own. echo 'Hi, ' . $data['other']->getName() . ', my name is ' . The output will be "Hi, Harry, my name is Sally.". Note that you can easy modify the greeting Sally uses from outside that Person object without changing the functionality of adding the friend. And there you have it – the observer pattern and an example, in less than 75 lines of code! Do you know nothing about Amazon Web Services (AWS) or Linux server administration, but want to get a PHP/MySQL server set up on AWS? I was once like you, relying upon my web host to have PHP and MySQL installed and configured, so it was a bit daunting initially to work with AWS, but it’s actually rather simple. Read on and I’ll show you how to set up PHP and MySQL on one of Amazon’s free servers step by step. You can have a functioning site up and running within half an hour. First things first: Amazon Web Services has a ton of different products, but the one you want is Amazon Elastic Compute Cloud (EC2). Go there, and click “Sign Up for Amazon EC2”. Once you’ve gotten that set up, go to the AWS Management Console, and click on “Instances” in the Navigation panel. An Instance is just a virtual server – so let’s create one! Click “Launch Instance” under “My Instances”, and select “Basic 64-bit Amazon Linux AMI”. On the Instance Details phase, select “Micro” (which is Free tier eligible). Continue until you need to enter the “Name” – if you don’t know what else to call it, just use “Web/DB server”. Next you create a Key Pair – this will be the credentials you’ll use to SSH into the box. The instructions here should be fairly straightforward. Next is the Security Group, which will be used to specify the firewall used for your instance. Feel free to use the default Group for now. Continue to the Review phase and launch it! You should now be able to SSH into your instance using your .pem file with ssh -i [FILE NAME].pem ec2-user@ec2-[IP ADDRESS].compute-1.amazonaws.com. Alright, we’ve got a server up and running! However, you may notice that this server has very little installed on it. which php? Nothing. which mysql? The same. Let’s install some software. Below I’ll show you how to set up PHP and MySQL on the server. I’ve separated PHP and MySQL so that it’s easier to adapt this to having two instances. Press ‘y’ for each of the prompts that shows up. Note that you’re logged in as ec2-user, so you need to sudo all of these commands. You should now be able to create and run a PHP test file. Next, let’s get MySQL up and running. Next, set the root password. I’ve found this password generator to be just dandy. You may want to fine-tune your database settings further than this, but this is a good start. We now have PHP and MySQL running on the box, but cannot access it through a browser. We need to configure the web server and set up an Elastic IP. First, let’s create a test PHP file that will be accessed by the browser. Create directories so that you can put your file in /opt/app/current1. Make an index.php file that contains whatever you want. In the AWS Management Console, click on “Elastic IPs”, then “Allocate New Address” under “Addresses”. Once the address is created, click on it, then “Associate Address”. Select the instance and associate it. Now click on “Security Groups” in the Navigation panel. Select the Security Group that you used for the instance (probably the default one). Under the “Inbound” tab, add an HTTP rule (port 80). Click “Apply Rule Changes”, and you should now be able to access your website! In your browser, go to http://ec2-[IP ADDRESS].compute-1.amazonaws.com/, where the IP address is the Elastic IP you made with periods replaced with hyphens. We now have a fully functioning PHP and MySQL server! That’s it for the basics, but there’s so much more that you can do now. I’ve found it handy to set up an administration area for my sites using a different port on the same URL. Note that port 80 is the default for web traffic, but 8080 is also commonly used. Create /opt/app/admin. Then, in httpd.conf, add the line Listen 8080 after Listen 80 and add another VirtualHost entry, using <VirtualHost *:8080> and pointing to the /opt/app/admin directory. Update your Security Group to allow traffic over port 8080. Make sure to restart Apache and you should now be able to access your admin folder through your browser at yourdomain.com:8080. You can then download phpMyAdmin into /opt/app/admin/pma and unzip it. Using the [DB NAME]_admin user, you can now manage your databases there through your browser. It can be very beneficial to performance to separate the web server and the DB server. To do this, you’ll need to set up two Instances, one of which has the web server httpd running and an Elastic IP, and the other of which has the MySQL server mysqld running. They can use the same Security Group, but you’ll have to add the MySQL rule (port 3066) for Inbound traffic to allow the servers to talk to each other. On the web box, instead of using “localhost” as the MySQL host, use the Internal IP address of the MySQL box. On the DB box, set up your grant permissions to allow from anywhere in '%.ec2.internal' (or just from your IPs). /opt/app/current is a Rails convention that I enjoy. What you should do is put your releases in /opt/app/releases/[release #], then have /opt/app/current be a symlink to the current release. Another (much more) common standard is to put web-accessible code in /var/www/html. Feel free to put your HTML code wherever you want; just make sure to update httpd.conf appropriately (and restart Apache). Thanks to Ryan Ausanka-Crues at Palomino Labs for help with this.